Perpetual pavement is a concept that was developed and has traditionally been marketed for high-volume applications like freeways and interstates. There is no reason, however, that this life-extending design approach can’t be applied to lower volume roads, or to rehabilitations of thinner pavements. Even pavements that were not originally designed to be perpetual can become perpetual pavements — one inch of asphalt at a time. What makes a pavement perpetual, and why should you care? In a nutshell, perpetual pavements are designed to develop distresses from the top-down, rather than from the bottom-up. This preserves the integrity of the bottom layers of the pavement structure, and confines damage to the top layer where it can be easily managed without requiring full-depth repairs or major rehabilitation. In fact, we now know that asphalt pavements can be designed to never develop bottom-up fatigue-related distress, regardless of how many loads are applied to the pavement, and how heavy those loads may be. As you would imagine, by confining damage to the top layer of the pavement, maintenance and rehabilitation costs over the life of a perpetual pavement are significantly reduced. And given the fact that the lower layers of pavement are preserved, the structural life of a perpetual pavement is on the order of 50 years or more, rather than the 20-year life expectancy that has traditionally been the standard. The cost savings and increased life expectancy are huge benefits that smaller agencies and local governments can’t afford to ignore. Organizations managing lower-traffic-volume applications may not be aware that a perpetual pavement is an option for them, because they have been under the false impression that they must build interstate thicknesses in order to have a perpetual pavement. Not so, according to Jim Huddleston, executive director of the Asphalt Pavement Association of Oregon. “Even if an existing county road or city street was not originally designed to be perpetual, it can become perpetual by adding as little as one inch of asphalt to the structure,” he said. Huddleston explains that adding one inch of asphalt to the pavement can double the fatigue life of the structure (see chart). If a three-inch pavement is expected to last 20 years, for example, adding one inch of asphalt will increase the fatigue life to 40 years. Adding another inch will double the fatigue life again (to 80 years), clearly qualifying the pavement as perpetual without constructing interstate thicknesses. A road need only have an asphalt thickness of five to six inches in order to have perpetual properties (such as cracking and rutting developing at the surface rather than bottom-up). For a new construction project, adding one more inch of asphalt typically amounts to no more than the cost of the material itself and delivery to the site. “It is the cheapest inch of asphalt you’ll ever buy,” Huddleston added, stressing that the life-doubling benefits of an extra inch of asphalt can be reaped for both new pavements under construction as well as existing pavements that have already carried traffic. Perpetual pavements have traditionally been thought of as an option for new construction only. In such cases, each layer of the pavement structure is designed to contribute to the perpetual nature of the pavement. Up to three layers of pavement are typically involved. Two factors – material properties and thickness – are evaluated as they apply to the structural demands of each layer. For example, the thickness, binder content and binder properties of the bottom layer are selected for optimum fatigue response and to resist bottom-up fatigue cracking. The middle layer relies on the stone-on-stone contact and a high-modulus asphalt to provide resistance to bending and rutting, in turn reducing the magnitude of the tensile strain at the bottom of the pavement. The surface layer employs stone matrix asphalt (SMA), superpave or open graded friction course (OGFC) mixes to resist rutting, weathering, thermal cracking and wear. In considering the options for each layer, the variables of material and thickness must also be evaluated in terms of how they will respond to the environmental conditions and traffic load of the particular location. It goes without saying that the foundation beneath the layers is critical as well, and must meet minimum requirements for support throughout construction as well as for the life of the pavement. Many agencies have traditionally approached their pavement designs by putting a thin asphalt layer on top of a thick base rock layer, believing this would produce the most cost-effective design. This approach is an outcome of empirical design methodologies that are unable to model or predict fatigue development in the asphalt layers. And while they do an adequate job of providing sufficient structural protection of the subgrade, these designs typically result in asphalt thicknesses that develop bottom-up fatigue cracking in less than 20 years. Huddleston recommends using only enough aggregate or improved sub-base material to support construction equipment and properly grade the site. The remaining structural requirements should be focused on the asphalt layer. Experience and studies show that the fatigue life of the asphalt layer is not highly influenced by the thickness of the aggregate base course, but is very sensitive to the thickness and properties of the asphalt layer itself (see chart). Beyond optimized performance, there are economic advantages to trading base rock thickness for asphalt thickness. By adding one inch of asphalt, you can reduce the aggregate base requirement by approximately four inches or more, offsetting the increased cost of the additional asphalt. Further, thinner aggregate bases require less excavation, yielding even more savings. And if that wasn’t enough, remember that every additional inch of asphalt effectively doubles the fatigue life of the pavement, multiplying savings even further by extending the maintenance cycle or potentially eliminating the need for major rehabilitation in the future. Research confirms that properly designed asphalt pavements, with thicknesses of five to six inches or more, tend to produce top-down cracking rather than bottom-up cracking. We also know that rutting in thicker asphalt pavements is confined to the surface layers, and does not develop in base or subgrade layers. These are some of the primary characteristics qualifying a pavement as perpetual. Determine the ultimate thickness needed to become perpetual for your specific site and loading conditions. Generally this would require the addition of one to two inches of asphalt to an existing 20-year-design pavement that has not yet failed from the bottom up. 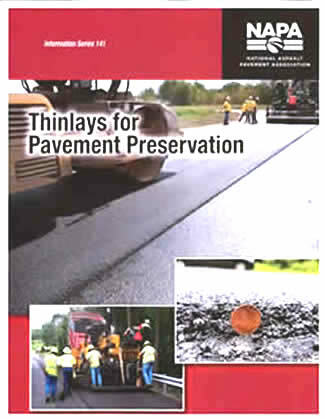 Schedule overlay(s) to achieve optimum thickness (typically a minimum of five to six inches of asphalt) before full depth structural distress occurs. Applying a surface treatment (like a chip or slurry seal) prior to achieving optimum thickness is a risky decision, and by not addressing the structural integrity of the road, can lead to full-depth failures. Manage the surface – i.e. mill and fill as necessary – to ensure confinement of distress to the top layer of the pavement. Huddleston notes that for this strategy to be successful, it is critical to have an accurate assessment of the thickness and condition of the lower layers of the existing pavement structure. Also, if cracks are present at the surface, don’t assume they are bottom-up cracks, especially if the pavement is greater than five inches in thickness. Take a core sample to confirm the direction and extent of the cracks. Once a pavement structure begins to show distress on the surface, there are two ways to address it – either with an asphalt overlay or surface treatments like slurry or chip seals. Surface treatments can seem attractive for their initial low cost. These treatments do not, however, add any structural value to the pavement, nor do they do anything to increase the life expectancy of the pavement. If you apply a surface treatment to a 10-year-old pavement that is designed for 20 years of traffic, 50 percent of the pavement’s fatigue life is already consumed and the surface treatment will do nothing to extend the life of the pavement. The surface treatment also does nothing to prevent a bottom-up fatigue crack from developing or expanding during the next 10 years of the road’s design life. Agency pavement management systems will often program additional surface treatments for such roads at 16 or 17 years of age, further masking a pending structural failure. Under this maintenance regime, full-depth distress will develop, reflecting through any future treatments and eventually manifesting as potholes. At that point, complete structural rehabilitation or entire reconstruction will be required. By the same example, if you applied a one-inch asphalt overlay to a 10-year-old pavement that is designed for 20 years of traffic, you will have effectively increased the fatigue life of the pavement to 40 years. Now, at 10 years of age, the pavement has consumed only 25 percent of its fatigue life. When the pavement is 20 years old, another one-inch overlay could be applied, doubling the pavement’s fatigue life again, extending it well beyond 50 years. Many agencies, by policy, have awarded no structural credit for thin preservation pavements like the ones advocated in this article. While a grade of “no credit” is appropriate for seal coats and chip seals, it is clearly not appropriate for thin asphalt layers, based on the facts presented here. An asphalt overlay does more than just disguise problems. It adds structural value to the pavement, providing increased tensile strength and protection against bottom-up failure. This can delay or entirely avert a costly, full-depth rehabilitation. Further, the application of an asphalt overlay one inch in thickness effectively doubles the life of the pavement structure, as mentioned previously, contributing to achievement of a perpetual pavement structure. In accordance with the principles of perpetual design – whether the structure is perpetual from the start or becomes perpetual over time – the resulting asphalt pavement can be maintained indefinitely without adding more thickness to the pavement (just mill and fill as the need arises). This simplifies the job of the pavement manager and saves significant financial resources over time by eliminating the cost of future major rehabilitation or reconstruction projects. This maintenance method provides many benefits beyond removal of surface distress. It allows the road surface to maintain its grade, which is important for fitting existing curbs, manhole covers and drainage features, as well as maintaining bridge clearances. It also provides the highest level of service to the driving public with the least amount of interruption. Thin overlays and mill-and-fill treatments (unlike surface treatments) can greatly improve smoothness, can be done at night when traffic is minimal, and can be opened to traffic immediately since no curing is required. And, the new pavement is environmentally friendly, utilizing high quantities of recycled asphalt pavement (RAP) that is produced during the milling process. For years, the longevity and cost-saving benefits of perpetual pavements were thought to be applicable only to high-volume pavements like highways and interstates. Evidence and studies show that assumption to be false. 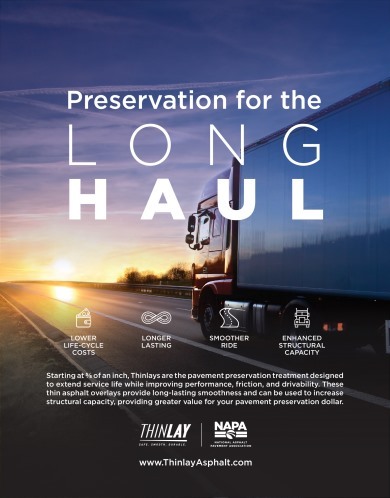 For local agencies with limited budgets, that extra inch of asphalt will pay for itself many times over by reducing long-term maintenance costs and doubling the life expectancy of the road itself.